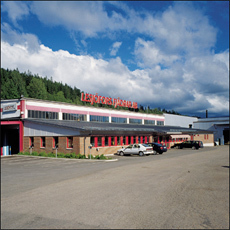 Springs have been manufactured at Lesjöfors since 1852 and today Lesjöfors is the largest manufacturer in Europe for aftermarket chassis springs. Lesjöfors' state of the art factory is designed to meet the demands of quality, flexibility and environment for many years into the future. Every spring is manufactured from high quality spring steel. Depending of the design, oil-quenched or unquenched wire is used. When oil-quenched wire is used all springs are stress relieved directly in line after the coiling process. Springs manufactured from unquenched wire are quenched and tempered after the coiling operation, giving the spring high strength without the need for stress relieving. In both cases the steel will have the same spring quality characteristics. The wire is cold formed to spring shape in computer controlled automatic coiling machines. When oil quenched wire is used, all springs are stress relieved. This treatment improves the fatigue strength. Some chassis spring designs have one or both ends ground. At Lesjöfors this grinding is done in special computer controlled spring grinding machines. All springs are protected from corrosion by zinc phosphate and powder resin paint. This technique gives an excellent protection against corrosion, even if there is a chip or a scratch in the paint surface. It also meets the standards used by vehicle manufactures.